Our re-designed CD-140SCE now also comes in a 12-string option, providing classic jangle and bell-like sound with premium appointments. 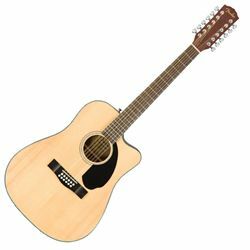 This model includes the same great featureset as its six-string counterpart, including a solid spruce top, rolled fingerboard edges and brand new ‘Easy-to-Play’ neck shape. The CD-140SCE is a top-tier Classic Design model which features a cutaway body for easy upper-fret access, a feature-packed Fishman® Presys preamp, elegant rosewood back and sides, and a tortoiseshell pick guard. The dreadnought-sized body provides traditional full-bodied tone with plenty of projection. A great choice for any aspiring player, the CD-140SCE delivers a bold playing experience.